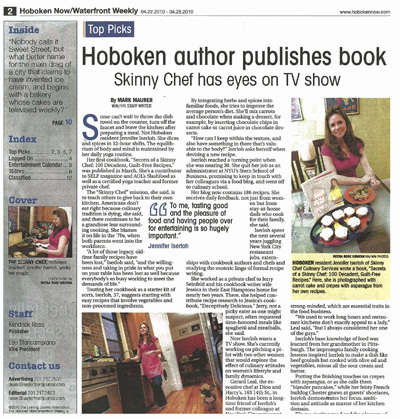 Last week, the weekly HobokenNow magazine featured me in a cover story. In the interview with Mark Maurer, I talked about my culinary background and the long journey that led to the publication of Secrets of a Skinny Chef. Below are a few excerpts, but be sure to read the full article online! The “Skinny Chef” mission, she said, is to teach others to get back to their own kitchen. Americans don’t eat right because culinary tradition is dying, she said, and there continues to be a grandiose fear surrounding cooking. She blames it on life in the â€˜70s, when both parents in the American family went into the workforce, she noted. Iserloh reached a turning point when she was nearing 30. She quit her job as an administrator at NYU’s Stern School of Business, promising to keep in touch with her colleagues via a food blog, and went off to culinary school. Her blog now contains 186 recipes. She receives daily feedback, not just from women but from stay-at-home dads who cook for their family, she said. Iserloh spent the next several years juggling New York City restaurant jobs, externships with cookbook authors and chefs and studying the esoteric lingo of formal recipe writing (…). Gerard Leal, the executive chef at Dino and Harry’s (…) in Hoboken has been a long-time friend of Iserloh’s and former colleague at New York City restaurant Veritas, where she was the only female cook. He said she’s very dedicated and strong-minded, which are essential traits in the food business.